"OOOoooOOoOOooo!! Very spooky!" 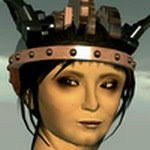 says Pandora Wrigglesworth, a woman dear to my heart, since she is the very one who invented that most indispensable of all contraptions - the clockwork brain! 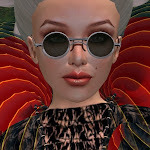 Personally, I wouldn't even know what to do without mine... And beyond my undying gratitude, the gentle reader should also be reminded that Ms. Wrigglesworth has been frequently featured on the NPIRL blog to date and previous posts on her output can be read here. "With our eerily effective weight loss system, there is no need to exorcise. Watch the pounds melt away in an instant and slim down to a petite 21 grams as you manifest your inner beauty with the frighteningly fashionable Ghostly Woman Avatar. Three skirts and two hairstyles billow in the cold winds of the spirit world. Your friends will gasp in amazement when they can see right through your entire body! Plenty of sculpting, glow, flex, and invisibility make this one of the most unique avatars you will ever see.... ....and possibly the last." 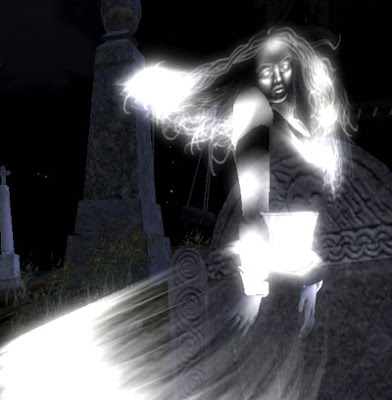 The Ghostly Woman avatar makes extensive use of invisiprims, transparency, and glow to create a very unique look and can be examined at Curio Obscura by teleporting directly from here.